Looking for a hands-free way to get your Tweets out into the world? Power App’s Speech2Tweet, which lets you create and send tweets by speaking into your iOS device, could be what you need. 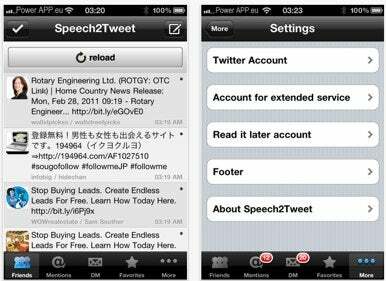 Speech2Tweet is a full-featured Twitter client that meets all of the service’s current security requirements. When you run the app, it briefly calibrates itself to account for ambient noise levels, and is then ready for you to dictate your tweet. Designed to allow you to tweet when using your iPhone’s on-screen keyboard is impractical, Speech2Tweet uses OpenEars open-source iOS library for English language speech recognition, as well as the CMU Pocketsphinx and CMU Flite libraries from Carnegie Mellon University. The app also includes features such as switchable automatic geotagging of tweets and photos, URL shortening, TwitPic image service compatibility, retweet, reply, Direct Messages, ad disabling, search for nearby tweets and tweeters, and automatic updating using Twitter’s new User Streams API. Speech2Tweet costs $2 and requires iOS 3.2 or later.